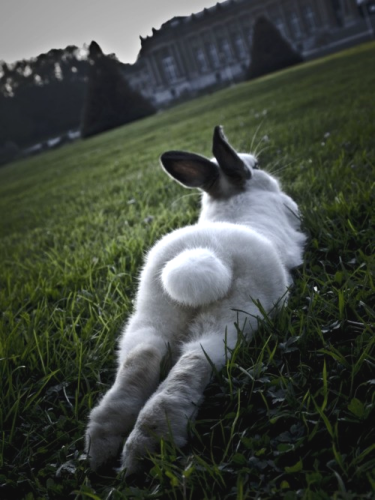 I just love this picture of the Easter Bunny. Sister I'm sorry you are facing so many issues right now. Are there volunteer groups in the community that transport patients to doctor's appointments? Sorry to hear that Connie's job assessment didn't go as she would have liked it to. Is the job assessment an agency that evaluates then places person in a suitable environment? Is the prospective job volunteer work or paid work? Is it possible the assessment agency will have work suitable for Connie in the future. So many funerals, so much witnessing of family sorrow. Pastors are only human and it must take it's toll. Can, thank you and everyone for your prayers. It is just sinking in with Connie and she is extremely depressed. It is so difficult to be turned down for work. Of course, her inability to talk is the biggest obstacle on so many levels. She was hysterical yesterday cause no body wants her. I'm headed to her house now. She has been volunteering where she gets speech therapy, however, transportation is a huge problem. I live 45 minutes away, her sons and daughter-in-law work, it is not impossible, but . . . I am trusting God to give me the wisdom to find a solution to help her. I feel her pain as if it was my own. I'm so sorry for the pain Connie is experiencing. I hope she felt calmer after your visit yesterday. I believe the Lord always provides a way out of no way . . . it will come. He never breaks His promises . . . "I am with you always . . ."
Your faith is such a wonderful thing Sister. I find your words so encouraging. i. e. His promises ..."I am with you always . . ."
Little Devin Davis's body has been found. Thank You Muffy. Rest In Peace Devin. Went to the doc Friday - I gained five pounds! - in the past three months. ::MonkeyNoNo::Guess there's no Easter bunny treats for me. Good thing I had those yummy hot cross buns last week! That is so cute Brandi! I love it. looks like the poor guy is hung over from too many jelly beans! Oh, Sister, she is very much wanted. She will find the right fit for something, whether it is work, or something else. I know how she feels. I really do. She is a child of God and God does not make mistakes. She will find her calling and then she will not remember why she was upset because it will fit perfectly. I promise you and I promise her. Please tell her to hang tight and that we are praying for her. God will lead her out of this hole, I promise you. God keeps the promises made to us. Bearly, thank you so much for reminding me of the promises of our merciful God. You are one of His angels. Starting next week, I am bringing her here to the parsonage for a couple of days (and doggie too yeah!) and will try to teach her data entry and spreadsheet. Praying now for a successful driving assessment in July. Looking forward and not backward! TBM, that's exactly what I thought when I looked at the bunny. Thank you Brandi for sharing this giggle! Molly is getting to be a very good girl! Well the truck was suppose to be ready last Thursday and I'm still waiting. Mac and I may need to go and have a little chat with the dealership. The damage was "cosmetic" or they probably would never get it back to me. I am now eating all the ears off the chocolate bunnies and will have to stock up again. Hope everyone is having a better day. 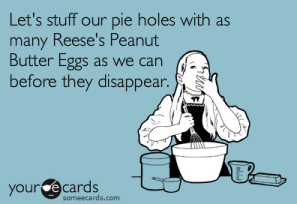 I have bought Reese's peanut butter eggs twice now for Easter. I hope JSM's sister will start shipping her bakery treats soon, ya'll will love them. My fav - chocolate chip cheese cake squares. Where's that fat monkey icon that I'll soon need. Page created in 3.769 seconds with 19 queries.